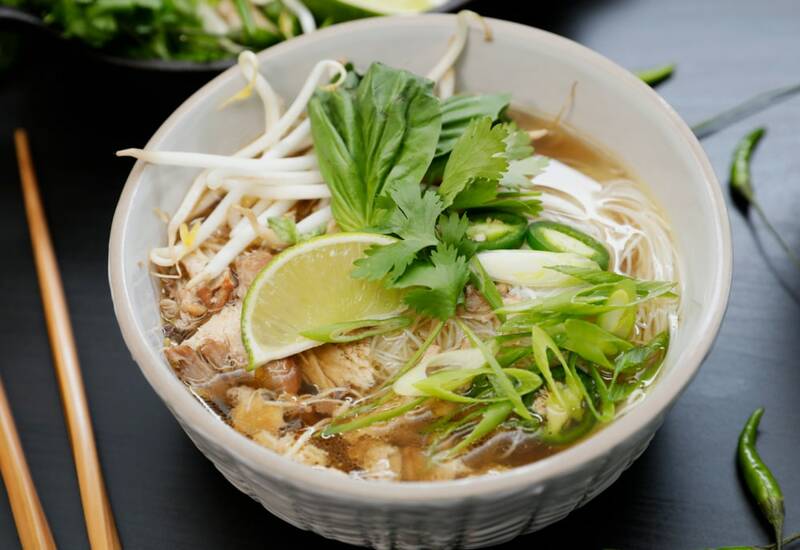 Our version of Vietnamese Chicken Pho features a homemade, aromatic broth topped with cilantro, lime, basil, and chili peppers for a bowl teeming with full-bodied flavor. This preparation uses mai fun noodles. These rice noodles are usually made from rice and water without salt. They are especially good in soups, but can also be used in stir fries as well. Nowadays these noodles can be easily found in the Asian section of larger grocery stores. Using the MultiPot Pressure Cooker, in just 40 minutes you will have a complete dish ready to serve. It will taste like an international vacation without leaving your kitchen! Never tried pho? It’s basically chicken noodle soup with fresh Vietnamese flavor! Adding the fennel and coriander seeds to the MultiPot on the saute setting allows the seeds to lightly toast in the oil. This brings out the natural oils and incredible flavor of these ingredients. Here's a look at more Pressure Cooker Recipes. Per Serving: 196 calories; 9g fat; 23.9g carbohydrates; 6g protein; 17mg cholesterol; 1121mg sodium. I had so much fun making this recipe! It was truly an experience. The pho broth was very authentic-tasting. I also loved all the toppings - the cilantro, basil, red onion, and chile pepper were very flavorful and the perfect addition to this dish. Really good chicken pho! The broth was really delicious. I added a little sriracha to the broth because I like it spicy. Other than that I did not make any changes. All in all really flavorful. So yummy! Pho is so good, I never thought I would learn how to make it on my own. The rice sticks are so light! I love this recipe and all the spices and flavors. The basil and cilantro give it a nice, fresh finish. Very good pho. I've tried both of the recipes on this site and loved them both. This one required a couple more steps than the beef pho, but both very good and very easy recipes. I liked the basil, chile and lime in this recipe. Very good flavor, especially with Sriracha. I couldn't find star anise, but I just added more fennel seeds to capture that licorice flavor. It's a little sweeter, and more mild but it's a close substitute. The only thing that was missing for me was the spice. I was able to remedy that by adding some sriracha to my bowl. I love a spicy broth! This recipe gets you a much better pho broth than you'd think possible in such a short time. I know most phos take hours and hours to get the right flavors, which is why it has been one of those dishes I don't bother to attempt for the most part. My sons, however, LOVE pho. I think it's because I didn't put everything together and they get to assemble. Whatever, it was a fun and tasty dinner! This was so good!! Used chicken broth instead of water for more flavor. Added siracha for an extra kick before serving! Yum!!! This soup is absolutely delicious! Very easy recipe, the hardest part is finding the rice noodles. Worth the hunt and I will stock up on them because I will definitely make this soup again! This was amazing! I have never made Pho before but the flavor was perfect in the broth. I would say it was better than even a restaurant. I followed the recipe exactly except for the green Chile pepper because I don’t like too much spice. This was very good, however we did have to add a lot more salt to the broth to make it edible. We all agreed the broth was pretty bland, but after adding the salt it was a 5 star meal. I’ve never even made soup before. This was like coming up to the plate and hitting a grand slam my first time in the majors. Instead of beans sprouts I used snow pea shoots. That was because my grocery store didn’t have any bean sprouts. I forgot to get coriander. Other than that I followed the whole recipe and it was superb.